In the spacious main saloon, enjoy a cocktail for 60 persons, a sit down dinner for 16 guests, a corporate presentation around the designer couches, or make room for the perfect dance floor. Crystal Blue is 80ft of pure super yacht luxury. 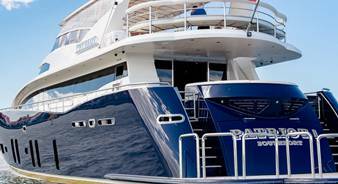 Designed by renowned Super Yacht Designer Sam Sorgiovanni, Crystal Blue is the ultimate head turner. Built in Australia to the highest international standards, Crystal Blue is the ultimate luxury super yacht entertainer. Licensed for up to 60 passengers there are 3 entertaining areas to entertain guests in first class comfort. Take in the uninterupted views from the huge open space on the bow of the boat with sun bed, gaze at clear blue skies or a starry night through the massive retractable sunroof in the main saloon, or kick back on the rear lounge with marble table. 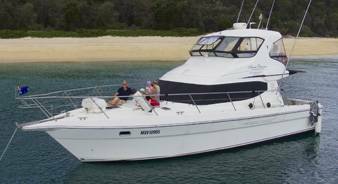 Crystal Blue is truly one of the most versatile charter yachts on the Gold Coast. In the spacious main saloon, enjoy a sit down dinner for 16 guests, a corporate presentation around the designer couches, or make room for the perfect dance floor. 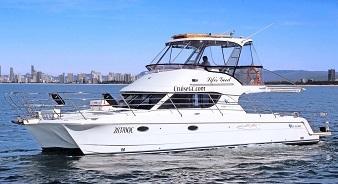 Crystal Blue is the largest luxury motor yacht that can sail under the Sundale Bridge allowing for cruising into the heart of Surfers Paradise. Explore the Broadwater in your own floating palace with a four bedroom, four bathroom layout, with individual climate control in each bedroom. 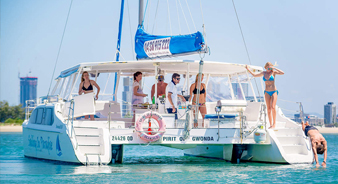 1 hour sun set cruise charter – Inc champagne, beer, wine $89 per head.